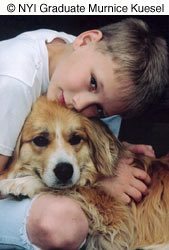 A posed picture that shows the love between a dog and a child is always a strong picture. Here, NYIP graduate Murnice Kuesel came in nice and tight to focus attention on this loving pair. What about the torn jeans that expose the boy's right knee? Is it distracting? We don't think so. Rather, it adds to the informality of the setting. I've been evaluating NYIP student assignments for nineteen years now. In that time there has scarcely ever been a week that I haven't seen the photograph of at least one dog. Let's see now: 52 (the number of weeks per year) times 19 equals 988. So I would guess that over the years NYIP I've seen an absolute rock bottom minimum of nearly 1000 dog pictures. And I know that there have been many more than that because I usually see more than one dog picture per week on the average. But, even considering the minimum, one thousand dog pictures is a lot, enough for me to give you some insight as to how one should photograph man's best friend. Parenthetically, some may say that one's mutual fund advisor is the real best friend, but for the sake of argument I'll stick with dogs; they're less aggressive. 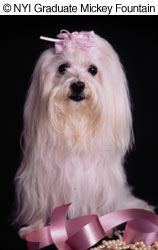 I've had six dogs in my life and have studied the breeds fairly extensively and even have been a frequent visitor at dog shows. I have a cat now, but therein lies another tail (ouch!). The catchlight in the eye's of this small dog tells us that NYIP graduate Mickey Fountain used flash to capture this portrait that features strong contrast between the dog's white fur and the black background. While we don't endorse dressing dogs up all the time, small dogs do sometimes have a bow atop the head, and here the photographer styled the setting by the use of ribbons and some jewelry below, adding a nice touch. So how should we go about photographing dogs? First of all, those of you who have studied NYIP material and read our Web site articles know that we have always stressed those familiar tried-and-true NYIP Three Guidelines. What are they again? Strong subject matter, focusing attention upon the subject, and then simplifying the picture by eliminating what's unnecessary and retaining what is indeed necessary. The very popularity of the dog around the world is a clear indication that our canine pals are good strong subjects, worthy of our best photographic efforts. Racing across the lawn while hauling in a Frisbee, aiding our police and military forces, guarding our homes, frolicking in the house, waiting by the door until we reach home, guiding the blind, whatever – the dog is great subject matter for our cameras. And how can we focus attention on those loyal companions? The means are numerous, and here are a few suggestions. The list is not comprehensive but will serve as a starter. No doubt you, too, will have some favorite ways of photographing dogs. The novelist Garrison Keiller ("Lake Wobegon", etc.) says that cats are intended to teach us that not everything in nature has a function. And, for the most part, cats really don't have very many specific functions. Mousers, yes, but a Parson Jack Russell Terrier will send more rodents to their just rewards in ten minutes than a cat will do in a half a day. The Jack Russell Terrier breaks the mice's necks in an instant and does not "pussyfoot", you might say. This is a great 'grab shot,' meaning that the photographer sees something happening, and without too much time of position the camera 'grabs' the shot. Any attempt to pose the picture would lose the candid feel and sense of spontaneity. NYIP graduate Michael J. Brown should be proud of capturing this moment forever. 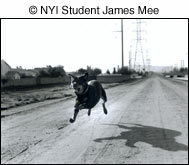 As a beginning, then, let's focus attention (second NYIP Guideline) on dogs by looking at their various functions. If we know the intended purpose for which the dog was bred then we have some important clues as to how the dog can or should be photographed. Take a German Shepherd, for example. You'll also see the breed called Alsatian Shepherd, Deutsche Schutzhund, etc. You may even know of a few unsavory names given by people who somehow feel threatened by this powerful and highly intelligent guard dog. And guard dog really is an accurate description of this dog's primary function. So, this strongly suggests a way to photograph a German Shepherd, a way to focus attention on your subject. In other words, show the dog being used for security purposes – guarding an installation, protecting a home, hunting down ne'er-do-wells, etc. Even photograph the dog used as a guide dog for the blind (a form of security). An examination of few breeds will suffice. 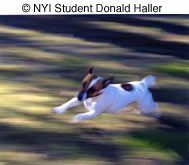 While this picture has so much dynamism we can't say for certain, we think that hard-driving pooch is most likely a Jack Russell Terrier, a breed known for it's fast-paced maneuvers, jumping skills and high energy level. NYIP student Donald Haller used the panning technique to perfection to capture this great picture. How about the Husky or Malamute? Although these are beautiful dogs and excellent pets, neither good looks nor companionship was the reason why modern man used these breeds. They are working dogs whose principal raison d'etre is hauling heavy loads, usually sleds. I once had the opportunity to photograph sled dogs in action, a marvelous sight to behold! You'll get your best photographs as the dog sled either approaches you or is going away from you, less so when the sled is at a 90-degree angle to you. Actually, these means of focusing attention on your subject are applicable to any subject in motion. When the moving subject is at a 90-degree angle to the camera the viewer becomes, automatically, a spectator to the event. That's all right, of course, but perhaps not as interesting as being a participant in the event. When the moving subject is coming toward you or is going away from you, there is a much stronger sense of involvement with the activity. NYIP graduate Richard W. Fredericks used a formal portrait approach to create this tight composition. We often advise students to use a profile or 2/3rds setting for human portrait subjects, rather than having them look straight into the camera. The same approach can work well for animals as well. Is there any lovelier sight in the world than a beautiful hunting dog charging through the woods, fields, and marshes in pursuit of its prey or retrieving downed game? As beautiful as a Gordon Setter, a pack of foxhounds, an English Springer Spaniel, or a Chesapeake Bay Retriever may be, still the hunting dogs are even more majestic when they are in the act of hunting or retrieving. And that presents wonderful chances for great photographs! A word of caution here: don't let your eagerness to photograph hunting dogs in action interfere with the actual hunting. For example, if a German Short Haired Pointer is actually "on the point", that is, in the act of stalking birds in the undergrowth and bushes the noise of your camera mechanisms could ruin the whole act. The birds take off skyward before the hunter is ready. The hunter will have missed his target and may even decide that you could be a likely substitute! So, talk over the situation with the hunter beforehand. I'm sure that he might love to have pictures of his dog and himself in action. But he also is an expert, presumably, and knows exactly how such a situation can be handled without ruining hunt itself. Possibly the answer lies in using a 300m or 400mm lens and standing off a good distance from the dog and the covey of birds. The head-on 'look right into the camera' approach can work just as well however. 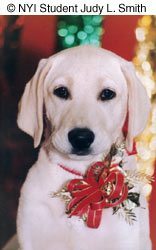 NYIP student Judy L. Smith gave this portrait a holiday feel with the use of the ribbon bow around the dog's neck and out-of-focus lights behind. Could this portrait have been made for a Christmas card? Most of us would agree that photographs of a dog at work (hunting, guarding, pulling a load, etc.) are exciting. The problem is, though, that most of the dogs we own aren't trained to do specific jobs. Sure, we would all like to focus attention on a working dog, but what to do if Fido usually lies around, sunning himself on the front porch? The truth of the matter is that most of our dogs are merely pets, not Lassie nor Rin Tin Tin, nor Yukon King – no real skills doing any useful work. Well, view it this way. Most of our friends, relatives, and casual acquaintances are not world beaters, either. They are primarily ordinary people doing ordinary work and living ordinary lives in most respects. What I'm suggesting is that we photograph our dogs in the same way as we photograph these people. Hanging around the house, eating, sleeping, playing in the yard, staring out the window, etc. This means the use of primarily simple means such as bounce flash, available light, casual unposed shots, "grab shots", what have you. Unlabored, unstructured, natural photography. In other words, the photographer as dog lover, not the photographer as "artiste". A few tips here: dogs are very much like people. Cats are not, but dogs largely imitate our own responses to life. 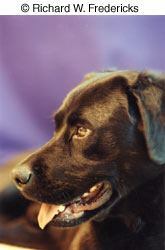 We can, with a large degree of accuracy, anticipate dog's reactions for these are so much like our own. Just as we should be prepared when photographing human beings, we need to be just a prepared when photographing dogs. I personally keep a loaded 35mm camera at the ready in my own house, knowing that frequent "photo ops" will occur. Ansel Adams ("St. Ansel of the Sierras") said that "chance favors the prepared". That means that there are lucky breaks, of course, but the prepared photographer seems to get more lucky breaks than the unprepared. This is especially true when photographing pets including dogs. Any lens and any camera will do, but probably normal and short telephoto lenses will be the ones more often used when photographing dogs. It's hard to say about flash. I had an English Cocker Spaniel once who was terrified of flash and would immediately begin to tremble all over. I had another English Cocker who was totally indifferent to flash and/or cameras. I also have known certain large guard dog types – German Shepherds, Rottweilers, Dobermans, Airedales – who would attack any photographers using flash. I have known other dogs who would attack unfamiliar photographers with or without flash; so be careful, proceed with caution! Flash does have one particularly useful characteristic other than its inherent ability to "freeze" the action. That is the ability to show detailed texture such as fur or whiskers. Side lighting, coming from a 90-degree angle, is very useful here. Any type of portrait that works for humans can work for a dog. 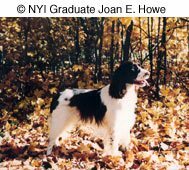 Here we see this gorgeous setter captured in an environmental autumn portrait setting, taken by NYIP graduate Joan Howe, who submitted many portraits of this beautiful animal during her studies with us. NYIP student James Mee gives us an entirely different type of location portrait, using a fast shutter speed to freeze this hard driving pooch in mid-air. The converging lines of the dirt roadway and the high-voltage power lines pull our eye to the right side of the picture, where the dramatic shadow cast by the dog makes this picture all the more dynamic. There's an element of mystery to this picture as well. We're not exactly sure where this dog is headed, but if there's a chase on, we don't envy whatever is being pursued. Could it be the neighborhood cat? As always, every photograph of every dog will be a better photograph if the third NYIP Guideline is followed: simplify the picture! Eliminate the unneccessary items and be sure to keep all the necessary ones in the picture. Finally, remember that most dogs are highly trainable. Perhaps they can even be trained to bark "f/11 at 1/125" instead of a mere "arf, Sandy" or the commonplace "bow wow wow".